The Lucky Strike is a Christian Family oriented campground on the Second Broad River, open year round. Campsites with hookups, Miner's Diner, gift shop, restrooms and shower facilities.The Lucky Strike campground has 51 campsites, 26 are full hook-up with electric, water and sewer, and 25 have electric and water, a dump station is available. The shower house has plenty of HOT water for warming up, after prospecting for gold in the cool river that runs alongside some of the campsites. Long term campsites are limited now, so if you are interested in a long stay, you will need to get your reservation in. 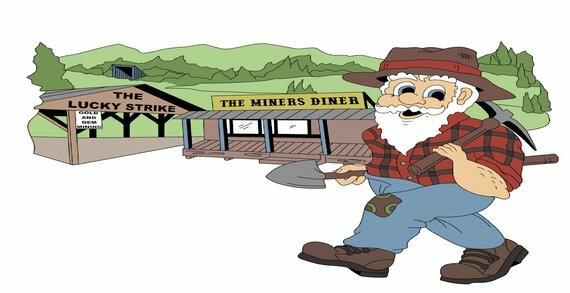 Come and enjoy the camaraderie of all the regulars at the campground, enjoy the regular Thursday night potlucks with music on the porch of The Miners Diner. No admission charge. Full service hookup $25.00 / night,Electric and water $20.00 / night. Ask about our monthly rates. Those camping with us do not have to pay an additional fee to get into the river and prospect using their own gold pan or sluice box. This cabin is a prospectors dream come true after a good day of looking for gold. There's a full bath with shower, Plenty of sleeping space, a sitting room to relax and a well appointed kitchen. Large tub shower, Large mirror over sink. Towel provided. Restrictions: No pets/ No smoking. All of this for $85/night and includes breakfast for 2 at the Miners Diner! A $100 dollar (US) security deposit is required. Room reservations must be cancelled 72 hours prior to arrival to avoid forfeiting your security deposit. During the off season, October thru March, the cabin is $75/night. This does not include the breakfast as the grill is closed for the winter. Call for your reservations today. Phone 828-738-4893.